In 1999, if the Choir had thought that Leslie Burgess’ retirement and replacement was going to be as seamless as had Dave Williams’ retirement in 1977, they were in for a bit of a wait. This process was to take nearly five years, during which time two ‘permanent’ appointments would turn out to be ‘temporary’. If a choir had to pick situations it most disliked, instability would be one of the top contenders. A choir without musical direction has no direction at all and this is detrimental to morale. The Choir first sang in rugby’s ‘holy of holies’ in 1992 with Tom Jones and Dame Gwyneth Jones, returning in 1993 to again be a component of the much publicized World Choir of 10,000 voices drawn from Britain and abroad, performing at the famous Arms Park to a capacity crowd. Special guest soloists included Welsh tenor Wynford Evans and international singing star Shirley Bassey. A unique experience. 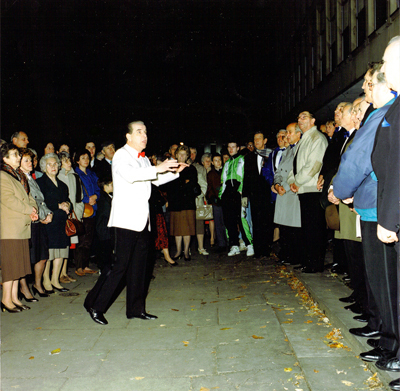 Tenby 1994, represented another visit to the Principality – ‘Land of Song’. The badge for the Choir was contrived in April 1992 by the then County Archivist, David Smith, in consultation with, and a final approval by, Gloucester County Council Secretary, David Seed. The badge is taken from the Gloucestershire County Coat of Arms, granted in 1935, but has its make-up from the ancient Arms of Gloucester and the Tudor Coat of Arms, together with devices from the Cotswold District Council Coat of Arms. The badge comprises a shield outlined in gold. The upper third – the Fess – consists of three panels each with a horseshoe studded with nails, symbolic of the early trade of Gloucester which, from even before the twelfth century, was famous for its ironwork and smithery. The Horseshoes: The one on the right is taken from the ancient Arms of the City of Gloucester, granted 20th October 1538, the left-hand one is taken from the Arms of the Cripps family, and the centre one from the Arms of the Allen family. Sir Frederick Cripps was Chairman of the County Council and Mr. Sidney Allen was High Sheriff in the year when the Arms were granted in 1935. It is an odd coincidence that all three Coats of Arms should have included horseshoes, which are not a particularly common armourial bearing. The two outside panels have a green background, signifying the fields and hills on which the woollen cloth made locally was laid out on tenterhooks to dry. The centre panel has a blue background symbolic of the great rivers of the Cotswolds – Thames and Severn – vital for washing the wool and dyeing the cloth. The lower two-thirds of the shield is red and comprises three chevronels in gold, originally part of the Coat of Arms of the de Clare family, Earls of Gloucester; there is a gold per chevron at the lower point of the shield. The two fleeces in gold, each banded and ringed in gold, are symbolic of the great flocks of Cotswold sheep and thus the woollen industry of the Cotswolds. Musical Director, Leslie Burgess, is challenged by Geraldine McCullough of BBC Radio Gloucestershire to make a choir out of raw recruits within 4 weeks! The Choir enjoyed years of sell out concerts with the Life Guards in Cheltenham Town Hall. Sadly, rising costs meant they had to come to an end. The English Association of Male Voice Choirs (EAMVC) was formed in 1982 and performed its first concert that year in Cheltenham Town Hall. The choirs taking part in that concert were those of Bream, Drybrook, Dursley, Filton, Hereford Police, Malvern, Churchdown and Cotswold male voice choirs. Churchdown and Cotswold are the only inaugural choirs still left in the Association but other choirs have since joined over the years. Cotswold Male Voice Choir is no longer taking part in Association concerts but maintains an interest as an inaugural member. 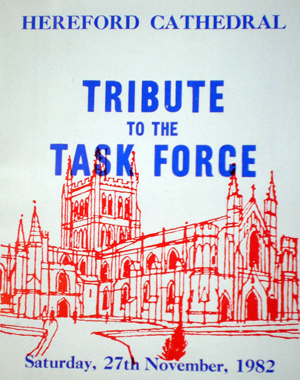 These same 'Comrades in Arms' were equally successful in November 1982, when combining with the Band of Her Majesty's Royal Marines, in ‘Tribute To The Task Force’, at Hereford Cathedral. 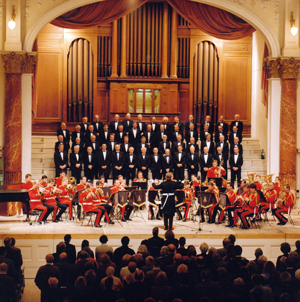 Honouring the many casualties sustained during the Falklands War, the concert proceeds were shared by the Hereford based Special Air Services Regiment and Hereford-connected H.M.S. Antelope Dependants' Fund. Despite that bitterly cold night and tight security, the Cathedral's capacity audience warmed to the splendour created by the talents of skilful bandsmen and singers - a moving tribute to the Task Force. The concert was recorded as an EP for posterity. Singing continued afterwards in the S.A.S. H.Q. What a gig! One April Fool’s Day, the Choir was booked to sing at the Rose's Theatre, Tewkesbury. During afternoon rehearsals the members took their seats on stage, closely monitored by the stage manager plus the theatre manager. Neatly in place, the singers were about to do a warming-up song when the back row of the staging collapsed. The entire rear row of members disappeared backwards. Horrified onlookers held their breath - until a solitary hand appeared over the back of the stage. A bald head, then another hand materialized, then slowly, all hands and heads, in a mountain climber's routine, were reunited in view. The theatre manager, jaw on a loose hinge, appealed to Don Baker, who was stage manager that day "Fantastic! As it's April Fool's Day, do you think you could keep that bit in as part of the act tonight?" "Well, yes" Don replied "if you can arrange to have some ambulances standing by!" The staging later proved to be secure and therefore 'All right on the night'. There were no casualties but that farcical afternoon accident was nicely redolent of an old Chad cartoon, "Wot - no - stage?!"